The American Metalcraft RWW10 wooden bowl can be used for salad, pasta, and more. This dish has a 58-ounce capacity and is durable for constant use. 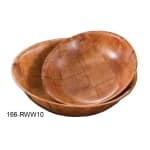 It takes up minimal space on tabletops with its 10-inch diameter, and the wooden material of the American Metalcraft RWW10 bowl provides a natural look. It should be hand washed only.